L – 1/2 Orange, P90X Results & Recovery Formula, 1/2 Cup Pasta Salad, 1/2 stick String Cheese, 1/2 Bag of Pretzels. 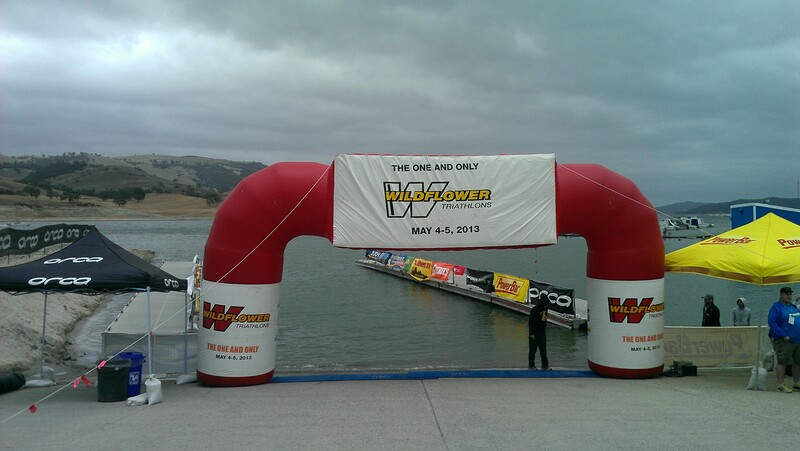 Cinco de Mayo and the Wildflower Triathlon – Olympic Distance race at Lake San Antonio in Central California, what an amazing day!. It was the 31st running of this classic and also a very significant race for me. Today marked 25 years between Wildflower Triathlon finishes. I started the the race in 89 but DNF’ed due to a nasty puncture wound at the start of the race from a piece of glass to the foot. Still hurts thinking about it. This race is extremely well put on and is combined with the Wildflower Festival which has all types of vendor booths and live entertainment all weekend. I was just there for the race, but next year I just may have to make a weekend of it. The wind was really blowing today which made the race a bit more: difficult for the swim – creating a surface current and rollers; interesting on the bike – big swirling winds with my high profile Aeolus 9 wheels :-\ spent a lot of time on the bulls grinding it out; perfect for the run – cool with a breeze that seemed to be at my back most of the time. My results from the race: 47th Overall and 6th in Age Group 35-39 – 1747 Finishers. This entry was posted in Events, Fitness, Triathlon and tagged AcidCheck, AcidCheck Caplets, AcidCheck Granules, Action Sports, Activit, Astragalus, Cordastra, Cordyceps, P90X Results and Recovery Formula, Pink Himalayan Salt, Shakeology, Smart Water, Speed Concept, Trek, Wildflower Triathlon, Wildflower Triathlon Results by fityak. Bookmark the permalink. Beef jerky is great for after a race. Protein, sodium, carbohydrates, and fat. Most things in moderation are OK, especially after the Wildflower Triathlon. That thing is a beast!